How many apps are on your iPhone? How many iPhone apps do you have in iTunes? What's in your iPhone's Dock? What iPhone software feature would you most like to see? A total of 599 people submitted valid responses by our 5pm PST deadline—an even bigger response than the previous day. 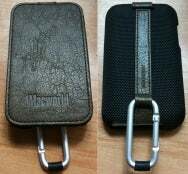 As a thank-you, we randomly picked one respondent, @SympaChou, to receive a Macworld-logo, Contoured Nylon Case with Flipcover from Shinnorie. SympaChou, by the way, has 98 apps on his iPhone. As for the rest of the readers who answered our question, while our survey shouldn’t be confused with a scientific one, it let us examine the use of third-party iPhone apps among a self-selecting group of Macworld Twitter followers. Here’s how that use breaks down. The largest group of respondents (32.4 percent) currently have 26 to 50 third-party apps installed, with the next largest group (26.2 percent) having 51 to 75. Just over 16 percent having 76 to 100. 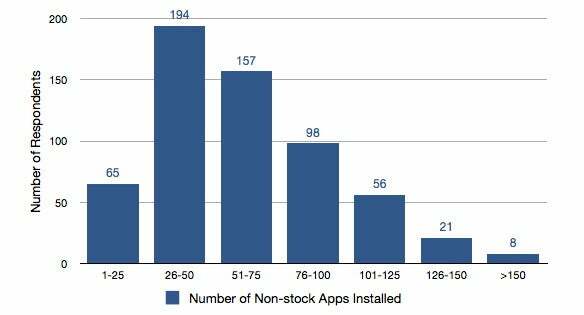 Taken together, that means 75 percent of our respondents have 26 to 100 apps installed. That leaves roughly 25 percent for the extremes: 14.2 percent of respondents have over 100 third-party apps installed, with fewer than five percent having over 125. At the other end of the spectrum, only 11 percent of respondents have 25 or fewer apps installed. The lowest number submitted was 4 apps. The highest number reported was 190. Wondering how someone could have so many apps installed with only 11 Home screens available, each holding 16 apps? It turns out that under the iPhone 3.0 software, you can install a much larger number of apps—some people have speculated an unlimited number. It’s just that you can only see the apps on those 11 screens. To launch one of the hidden apps—or to even know that it exists on your iPhone—you must use 3.0’s Spotlight feature. If you add up the responses from all 599 people, the total number of third-party iPhone apps reported amounts to 37,729. Which means that the average number of installed third-party apps among our respondents is 63. For you stat junkies, the median is 58 and the mode is 48 (which had 15 occurrences, although there were a good number of other numbers with 12, 13, or 14 occurrences). Me? I’ve got 124 apps according to Settings -> General -> About -> Applications, although I’ve got a heck of a lot more in iTunes that aren’t currently installed on my phone—but that’s a question for another day (hint, hint). You can follow @macworld on Twitter to participate in the other surveys this week; just respond to our morning question each day. We’ll randomly pick another (US-resident) respondent each day to receive a case.